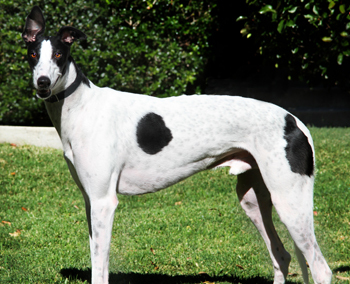 Plaza, aka Xtrem K's Plaza, is a handsome, 2½-year-old, white and black male born April 25, 2008. His sire is Kiowa Sweet Trey, and his dam is L's O Baby. 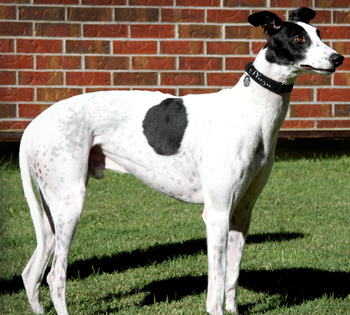 Plaza started his racing career on October 22, 2009, at Southland Greyhound Park in West Memphis, AK. This career came to a halt on Saturday, March 13, 2010, at Gulf Greyhound Park in La Marque, Texas, when he suffered a career ending injury. He suffered a fracture to the base of the right calcaneous with major instability to the calcaneal/cortal joint. 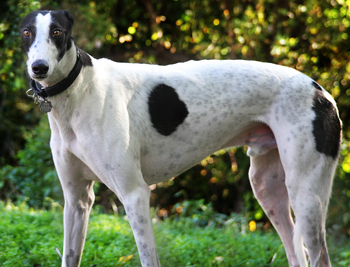 Surgery was performed on Tuesday, March 23, 2010, by Dr. Bob Radasch of the Dallas Veterinary Surgical Center. Dr. Radasch stabilized the fracture with a screw thru the calcaneous to the fourth tarsal bone and then added a figure 8 tension band wire. Plaza's screw was removed on September 24, but the wire was left in. This boy is ready to find his forever home! It is not known at this time if Plaza is small animal or cat tolerant.